Deciding on a destination wedding automatically makes me a fan of you. I’m a huge advocate for travel but I especially love when couples opt out of the ordinary and choose to take their wedding outside their city or even their country! That being said, choosing a destination wedding comes with its own unique challenges and is by no means easy to organize. As a destination wedding photographer, I’ve shot in 3 continents and have seen the craziness behind the scenes so I know what it’s like. Having the world to choose from can be romantic but can also be dizzying and lead even the most resolute person into decision paralysis. Luckily, you’re doing your research to make an informed decision and are already on the path to narrowing down the destination that makes your heart flutter and makes the most sense. My hope is to spark ideas and to give suggestions that guide you toward the city or country that’s going to make a lasting, special memory. Here are some pros and cons to popular wedding destinations all over the globe! Pros: There’s a reason why Italy is mentioned first and it’s not because I’m half Italian! Places like Positano look like they’ve been pulled from a fantasy and imposed into real life which is why Italy makes for one of the most desired destination wedding locations for both Americans and Europeans. For a destination wedding photographer, Italy is usually at the top of the list for goal destinations because of the romantic magic in the air and the charm around every corner. Italy is also a highly sought out destination for honeymoons, making it the perfect place to kill two birds with one stone. Not to mention France and Greece which are only a short and inexpensive flight away. The proximity to other honeymoon destinations after the wedding makes Italy a convenient choice for those who are either staying in the country or heading somewhere nearby. It’s nearly impossible to have a bad wedding experience in Italy, which makes it a no-brainer and a safe choice. It certainly doesn’t hurt that you will have every destination wedding photographer in Italy chomping at the bit to capture you and your future spouse. A destination wedding in Italy is a good choice if you’d call yourself a foodie and love the idea of sipping old-world wine on the Mediterranean sea. Cons: For Americans, a destination wedding in Italy may seem like idyllic but with 10+ hour flights from most American cities and average round-trip tickets costing as much $500-700, it’s not an unchallenging journey to make. A trip to Italy isn’t something everyone can necessarily say yes to without some planning, and even so, a commitment of 2-4 days including travel isn’t easy for anyone with existing obligations. In my trips to Italy, I’ve also observed a significant language barrier which means a bilingual wedding planner is essentially a must. Although this isn’t a huge challenge and this is an obstacle that presents itself in several countries, it’s still an extra step to consider in the process. I will say, the two cons of distance and a foreign language are inherent in the nature of many destination weddings and outside of these components, an Italian destination wedding remains a great choice. Pros: The breathtaking islands of Hawaii are what often come to mind when people think of paradise. I’ve already recommended this mountainous marvel for those who want to elope in Hawaii but it functions just as well for a place to get married, if not better. Hawaii has the convenience of not needing a passport for those who live in the United States and it’s on most people’s travel list anyway. I’ve had conversations with Hawaiian destination wedding photographers who tell me most people attend destination weddings in Hawaii just to roll a bucket list vacation and travel for the wedding into one trip. There’s an indefinable quality about the culture that draws people in. I’m not sure whether it’s the spellbinding hula dancing, charming ukulele-playing, or having a lei around your neck, or a combination or all 3. Hawaii is one of only two places I’ve ever heard exclusively positive things about on top of being one of the few places I’ve personally been to that ended up being well above my expectations. I’d call Hawaii the right fit for your wedding if you love a salty breeze or consider drinking coconut water while swinging in a hammock the perfect afternoon. Cons: Not everyone loves what comes with a tropical climate i.e. heat, humidity, and lots of rain. Having a Hawaii destination wedding at the wrong time of the year can almost guarantee rain on your wedding day, especially in Kauai. If you’re the kind of person who wants an outdoor venue, make sure you find a Hawaii wedding photographer who plans accordingly, something I recommend everyone should look for in a destination wedding photographer. Additionally, Hawaii, although a part of the US, is in the middle of the Pacific Ocean and presents a few difficulties to travel to. It doesn’t have the language barrier the same way that a place like Italy does but that obstacle being removed comes with a financial catch. Because of the desirability as a wedding destination, venues and other vendors can charge an arm and a leg and completely get away with it. In the end, the weather can be navigated around and a wedding is going to be expensive no matter what so don’t let these cons steer you away from a Hawaii destination wedding. Pros: Out of the locations I’ve mentioned, I’m happy to say I reserved my personal favorite for last. 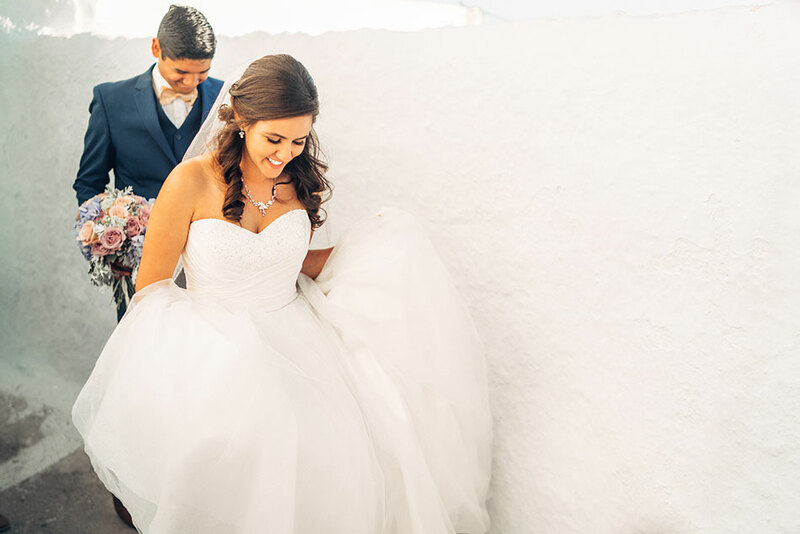 Arguably one of the most underrated destinations for weddings, Mexico has the same exceptional qualities of any popular Caribbean or European country in amazing beaches and rich culture and history with the added level of convenience and budget-friendliness. I could go on about the food which is about 1/3rd of the price of most US and European restaurants and even more tasty, or the people who are as outgoing and authentic as anyone I’ve ever met, or even the unbelievable natural beauty which seems to be inescapable at every turn. Mexico has chill, surfer-welcoming pacific coast beaches in the state of Oaxaca, bohemian jungle paradises in towns like Tulum, and more tourist-friendly cities with gorgeous clear water in Playa Del Carmen. The cost of a flight to a Mexico destination wedding is more than likely going to be the same as any domestic wedding which is an added bonus for guests. For all these reasons and more, I’m proud to call myself a Mexico destination wedding photographer. For those wondering what other options Mexico has or wants to hear more about the options there, make sure to look over where to get married in Mexico. Book a destination wedding in Mexico if you love colorful towns or consider strangers friends you haven’t met yet. Cons: There’s a similar mix of language barrier and potential hot climate aversion that have been mentioned with the previous two destinations but other than that, Mexico doesn’t present any real challenges as a fantastic place to get married. Certain places are currently experiencing issues with violence but nowhere that’d be considered popular for a destination wedding, and certainly not in the places tourists frequent. The only con I can think of the perception of danger from some people, as the impression of Mexico from most areas in the United States is that of a dangerous place, even though that could not be further from the truth. As a Mexico destination wedding photographer, I’ve encountered zero safety issues and couldn’t recommend Mexico more to tie the knot in. It’s hard to write any cons at all when the locations in this list are all so amazing and the negatives about these places are so few and far between. For me personally, there’s nothing that would detract me from selecting a location if it really stuck out to me because the pros are overwhelmingly more positive than the cons. As a destination wedding photographer, I’d jump to take photos in any of these locations if I sensed the couple was a right fit for me to work with. Mexico has the most incredible culture and so much variety between charming rural towns and bustling urban areas and it personally connects with me because I grew up in Miami, a heavily Latin-influenced city, so it feels like home. Italy connects with me because there’s no place like it in the world and it’s one of the first countries I traveled abroad to visit so it’s got a special place in sparking my love for travel and wanting to be a destination wedding photographer. Hawaii is where I envision the tropical version of myself, surfing every morning and spending more time in the ocean than on land. There’s a chance you connect with one of these places in a unique way and the reasons are probably nowhere near my own, which is why it’s up to you to feel out exactly what’s going to be the right fit for you and your future spouse. If another location came to mind when you were reading this, there’s a pretty high chance I’d love to shoot there for your wedding too! For the places on this list, or any other special destinations you may have in mind, I’m always available to give tips, answer questions, and be a help for your destination wedding photographer needs any way I can. Fill out a form submission or send me an email and we can discuss the destination that will make for an unforgettable wedding day!